The President of India, Shri Pranab Mukherjee, has given assent to the Whistle blower’s Protection Act, 2014. The Bill was passed by the Lok Sabha on 27 December 2011 and by the Rajya Sabha on 21 February 2014. The Act aims at providing a mechanism to encourage persons to disclose information on corruption or willful misuse of power by public servants, including Ministers. Adequate protection would be given to persons reporting corruption or willful misuse of discretion, which causes a demonstrable loss to the government, or commission of a criminal offence by a public servant. The Act punishes any person making false complaints thereby protecting honest officials from undue harassment. The Act extends to whole of India; expect the State of Jammu & Kashmir because of the special status enjoyed. Definition of ‘disclosure’ - amended to include willful misuse of power or discretion, which leads to a demonstrable loss to the government or a demonstrable gain to a public servant or any third party. 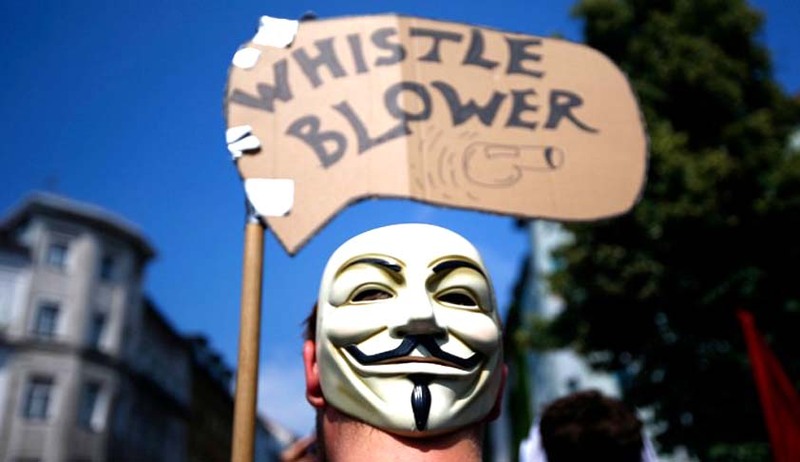 A couple of unfortunate incidents lead to the movement demanding for whistle blower’s protection. Satyendra Dubey , a whistleblower was murdered after he exposed corruption in the construction of highways. He was working as an engineer in National Highways Authority of India. Shanmughan Manjunath, was found dead for sealing a petrol pump that was selling adulterated fuel. He was also a whistle blower and an Indian Oil Corporation officer.